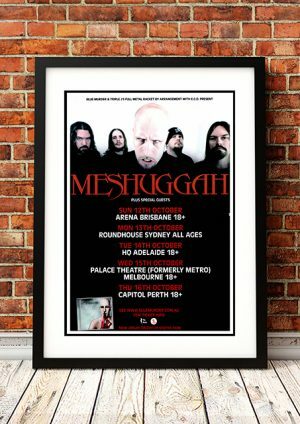 Classic Meshuggah Band Concert Posters and Memorabilia! Buy Online Now! Offering a complex form of metal that combined the sweeping adventurism of math rock, the oddball tempos of experimental jazz, and the stunning brutality of thrash metal, Meshuggah raised the bar for metal bands everywhere upon their debut. The roots of Swedish metal band Meshuggah were planted in 1985; originally named Metallien, the founding lineup included frontman Roger Olofsson, guitarists Peder Gustafsson and Fredrik Thordendal, bassist Janne Wiklund, and drummer Örjan Lundmark. After a few demos made the rounds, Metallien broke up and Thordendal continued the band with a different lineup and a different name. The original lineup of Meshuggah also included vocalist Jens Kidman, guitarist Johan Sjögren, bassist Jörgen Lindmark, and drummer Per Sjögren. A handful of demos followed before Kidman left the group to form a new outfit Calipash, with guitarist Torbjörn Granström, bassist Peter Nordin, and drummer Niclas Lundgren; the surviving members of Meshuggah soon disbanded, and when Granström left Calipash, Thordendal assumed guitar duties in the new band. We stock some awesome Meshuggah Band Concert Posters.